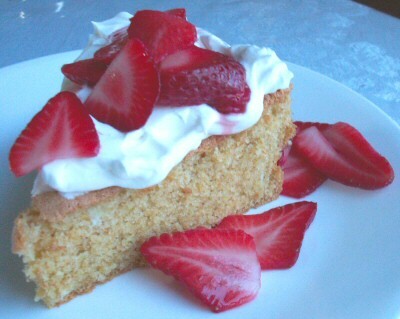 Here is a real simple recipe for shortcake that is quick and easy to make. It soaks up the juice from the strawberries in a most delicious way. It’s a tasty cake even if you don’t have any fruit to add to it. Just dust it with a little powdered sugar and eat it plain and simple. Sift or stir together all the dry ingredients. Add the rest of the ingredients and blend well. If you are using an electric mixer, beat on medium about 2 minutes. Pour into an 8 inch pan (square or round) that has been greased and floured. Bake at 375 degrees for 25-30 minutes until a toothpick inserted in the center comes out clean. Cool ten minutes on a rack before turning out of the pan. Cut cake into serving sizes and top with fresh strawberries that have been washed, stemmed, sliced and sweetened with a bit of sugar. A dollop of whipped cream on top seals the deal.